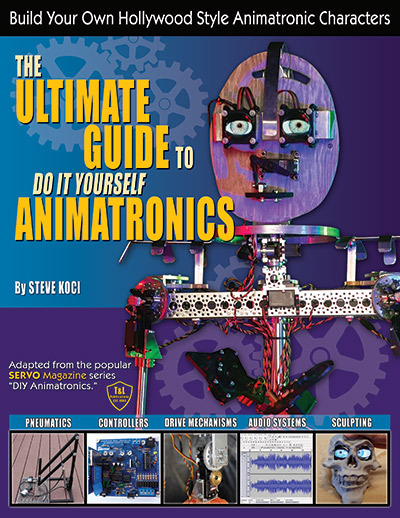 The Ultimate Guide To DIY Animatronics (adapted from the popular SERVO Magazine series "DIY Animatronics" by Steve Koci) explores the fascinating world of animated character creation with the home hobbyist in mind. There’s no need to be an expert as anyone with a curious mind and a will to learn can create their own amazing designs. The goal of DIY Animatronics is to provide a process that is easy to understand, follow, and reproduce. Whether you’re creating something to be used for a holiday decoration, school project, or business display, the procedures demonstrated in DIY Animatronics will guide you through the entire process and get you building your own "Hollywood Style" animatronic characters. From the publishrs of Nuts & Volts and SERVO Magazine. First printing is sold out! Now in its second printing - In Stock and Available for Immediate Shipping!